We couldn’t be more excited* to be involved in Hand in Hand Cardiff 2019, the nation-wide LGBT+ Choral Festival. We’ll be in Cardiff on the Fri 16th – Sun 18th August 2019, shoulder to shoulder with many other fantastic LGBT+ choirs from across the country. It’ll be our first ever trip over the border – and possibly our largest ever performance! The choir are already busy planning, preparing and learning new songs. Stay tuned for more info! **Seriously, if you think we’re dropping hints about our setlist, they’re all red herrings. Sorry. 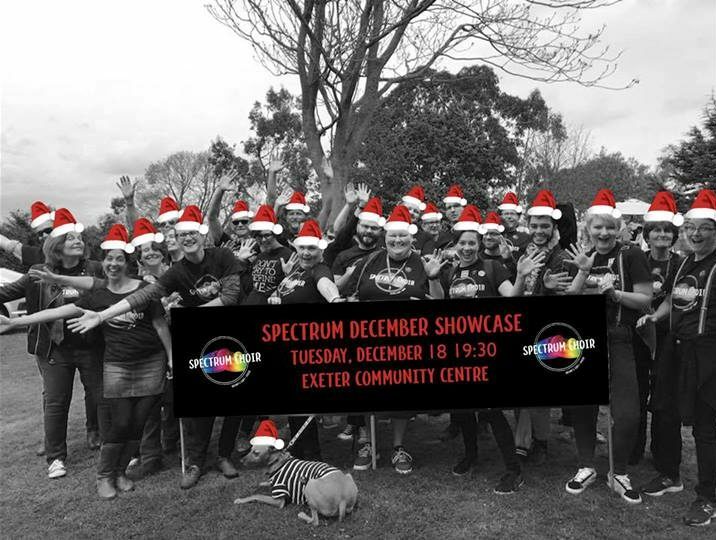 Everyone is welcome to join us on Tuesday, December 18th at 19:45 for our annual Winter Showcase at Exeter Community Centre! As 2018 comes to a close, Spectrum are celebrating winter festivities with a showcase of some of what we’ve been learning in the last few terms. Whether you’ve come along recently, or not been for a while, we’d love to see lots of old and new faces! The first part of the session will be a performance from members who have attended this term, followed by a short break for food and socialising, and then we will invite everyone to learn a few simple songs with our director Emily. It’s really important that we are out of the Community Centre by 21:20, however we will be going just next door to the Iron Bridge Inn for drinks and further merry celebrations, and we hope you will join us there! We encourage a donation of £5 to the choir for this event to keep the choir running, and so we can do more performances like this in future. We’re warming up our voices and working on our tans ahead of our fabulous End of Term Showcase this evening! Everyone is invited to join us for an evening of singing, snacking and celebrating our community in Exeter Community Centre tonight. We’ll be sharing some of the songs we’ve been working on this term – with the opportunity to sing with us of you’d like to. The show is tonight (Tues 17th July) at 7.30pm-9.30pm, in the Ballroom, Exeter Community Centre, right at the top of St David’s Hill. Entry is free! But if you’d like to support the choir, and help us continue providing a welcoming space to LGBT+ people and their friends, we’ll be accepting donations. Pink Singers’ Mixtape – check out our set!